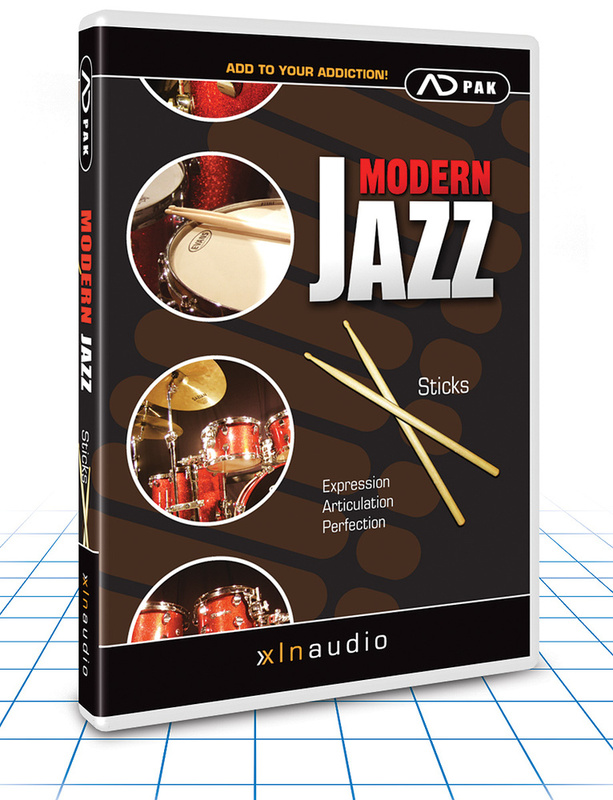 XLN Audio's very fine Addictive Drums is a virtual drum instrument for Mac and PC that strikes a useful balance between the detail of the hard‑drive‑hogging heavyweights and the simplicity of a more basic product. Its default sound library is tailored mainly to modern pop and rock, but XLN have been beavering away to create a number of themed ADpak add‑ons. Newest among these are twin Modern Jazz libraries. Both were sampled from the same Premier Gen‑X drum kit, but as the names suggest, one set of samples was played with brushes (with a soft felt beater on the bass drum) and the other with sticks and a plastic beater. Both kits, which show up as additional options in the various Addictive Drums menus, require modest hard drive space (under a gigabyte), and have to be authorised fairly painlessly at the XLN Audio web site. The Brushes library requires the 'Brush support' utility to be installed, presumably to implement the various snare sweeps that aren't possible with sticks. Unlike the factory library and the earlier Retro ADpak, these expansions include only bass drum, one snare, and one set of toms and cymbals. Nor does the Sticks pack contain any additional articulations, so if you want rolls, flams and so on, you'll have to program them yourself. However, all the drums have been sampled with the same miking options as the original, so you can balance close, overhead and room mics to taste, and process with the various built‑in effects or route drums to their own outputs for processing in your DAW. You don't have to listen for long to realise why these ADpaks are called Modern Jazz. If I were forced to use a single word to describe the sounds on offer here, it would be 'crisp': the Ludwig Acrolite snare is tight, bright and focused, while the bass drum and toms have a musical but controlled ring to them, and the hi‑hats have a fresh but not over‑bright splashiness which responds well to dynamic playing. The presets do a good job of showing the range of sounds you can get from the different miking and processing options. Lean mainly on the close mics and you get a light but punchy kit which would be perfect for complex up‑tempo playing or fusion, while bringing the room mics into play takes you more into live‑off‑the‑floor big‑band territory. Even the brushed kit can pack quite a wallop, with the exception of the delicate snare sweeps. You need a bit of self‑restraint when using these, as it's easy for them to get lost in the mix, but they work well and allow you to keep a continuous sweep going for as long as you like. The soft felt beater on the bass drum is a definite highlight, delivering a real rounded thump that retains both impact and warmth. There's also a nice selection of very well programmed MIDI loops, grooves and fills. I'm not sure how many producers find themselves needing to program real‑sounding drum parts for modern jazz styles, but for those who do, this does exactly what it says on the tin. 2twenty2 +44 (0)845 299 422. 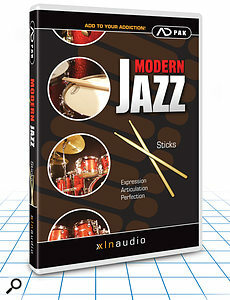 Modern Jazz Sticks $68, Modern Jazz Brushes $59.